← My Son Came Home!!! I remember wondering if there would be a way to write joy and pain in the same space. It was important to me because I was teaching a course called “Love that Heals.” We were learning about suffering and exploring how joy can be embraced even when pain is unrelenting. 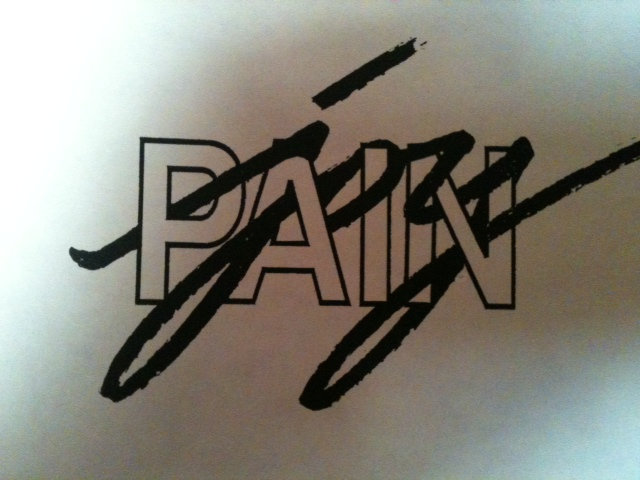 I called our graphic artist and asked her to write joy and pain in the same space. The logo above is what she produced for me. I have used it extensively for the past 25 years. A couple of weeks ago this same artist stepped back into my life and asked me to pray with her. As I listened to her I heard a heartbreaking personal story. Then, though her eyes were moist, she broke into a hearty laugh that was easily recognized as hers. In reflection, I realize this friend not only wrote this graphic but also is living it. This morning, I was reading about how David stood up to the Giant (they have that in a Big “G” in the Bible, you know)…with five smooth stones (four of which were unnecessary–I think for Goliath’s brothers…or whomever, in case they caused trouble) and a stick…AND a BIG–HUGE! GOD on his side. So there! Because of that…. I am choosing to see the cup as half full. Stay tuned to learn what God will do! How does faith through aging eyes create a space for both joy and pain? This entry was posted in Stories and tagged artist, Giant, God, joy, logo, Love that Heals, pain, pray. Bookmark the permalink. Now You Are TWICE MINE!